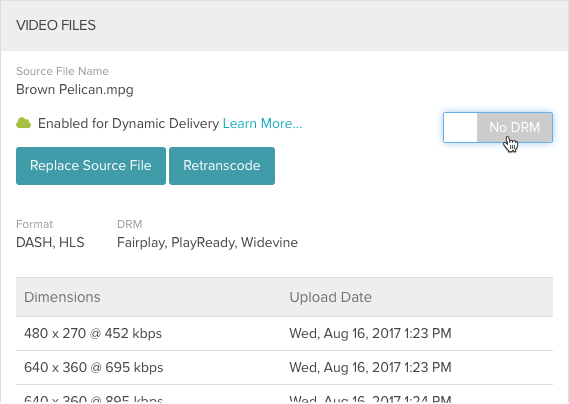 This topic provides an overview of how to create custom ingest profiles for use with Dynamic Delivery transcoding. Ingest profiles contain the transcode settings that will be used when videos are transcoded. The ingest profile editor that is displayed will change based upon the transcoding options that have been configured for the account. Note: The ability to create and edit ingest profiles is available only to publishers with Enterprise and Professional accounts. To access the Ingest Profiles administration page, click the ADMIN link and then Ingest Profiles. A list of ingest profiles will appear. Note: To access the Ingest Profiles page, you must be a Video Cloud Studio user with the Administrator role. The Ingest Profiles administration page can be used to create new ingest profiles. Ingest profiles are defined using JSON. Click the ADMIN link in the Studio header. Click the Ingest Profiles link. Click New Profile > Dynamic Delivery. The profile editor will open. Decide whether to Store master files. Storing the master keeps a copy of the master file and provides the ability for the video to be retranscoded in the future without the need to upload it again. For additional information on archiving masters, see the Archiving Masters document. Enter the Width and Height for the Poster and Thumbnail images. Capture images automatically at upload time - Video Cloud will capture poster and thumbnail images when the video is uploaded. Images are captured at the 50% point in the video. Don't capture images; I'll upload or capture my own images - Poster and thumbnail images will be captured or uploaded using the Media module. Add the renditions you need for the profile. Be sure to select both video and audio renditions to ensure your videos play with audio. Also add progressive (MP4) renditions if you want to specify the downloadable renditions available for the video. Click Add Rendition. To view the audio and renditions that are available, click the View Rendition List link. While is possible to create a profile that will generate only progressive renditions, if you upload videos using that profile, thumbnail and poster images will not be captured during transcoding. Use the Select Rendition dropdown list to select an audio, video, or progressive (MP4) rendition to include. The rendition details will display in the table. Continue to click Add Rendition to add additional renditions. Click Save to save the new profile. Custom ingest profiles can also be used for Social clipping. Generally, the lower quality renditions included in the Brightcove default ingest profiles aren't necessary for Social distribution use cases, so custom clipping ingest profiles can typically be limited a small number of medium to high quality renditions. For example, a custom clipping ingest profile that includes the video3500, video2000, and video1700 video renditions is more than adequate for most Social distribution use cases. Using a custom profile for Social clipping allows you to apply additional transformations to clips, such as the addition of watermark images. To create a custom profile with a watermark, contact Brightcove Support. If you need to create a profile that is similar to an existing profile, you can duplicate an existing profile and then edit it to make the needed changes. Click on the ingest profile to duplicate. Use the Profile Editor to edit the profile name and definition. Renditions can be removed by clicking the remove icon ( ) next to a rendition. DRM is supported, but works differently than for legacy ingest profiles. 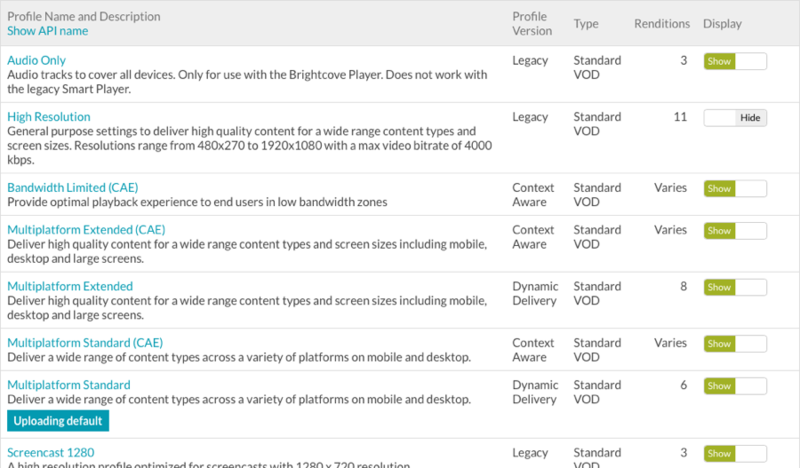 Contact Brightcove Support to set defaults for DRM packaging of your videos. You do not need to specify DRM packaging in your ingest profiles. If your account is enabled for DRM and you want to deliver some titles without DRM, edit the video properties in the Media module and set the DRM flag for the video to No DRM. Note: For information on creating a DRM-enabled Brightcove Player, see the DRM Plugin topic. The Ingest Profiles administration page can be used to edit ingest profiles. Note that the default set of ingest profiles (marked Standard VOD) can't be edited. Click on the ingest profile to edit. Use the Profile Editor to edit the profile definition. Renditions can be removed by clicking the remove icon ( ) next to a rendition. The Ingest Profiles administration page can be used to delete ingest profiles that are no longer needed. Note that the default set of ingest profiles (marked Standard VOD) can't be deleted but they can be hidden if they are not needed. Click the Ingest Profiles link. The Ingest Profiles administration page will open displaying the ingest profiles that have been created for your account. Click the delete icon ( ) next to the ingest profile or click the profile name and then click the Delete button. Confirm the deletion by clicking Delete Profile. A default ingest profile can be configured for when videos are uploaded and when creating clips using the Social module. The upload default profile is indicated with next to the profile name. The social clipping default profile is indicated with next to the profile name. Click the Ingest Profiles link. The Ingest Profiles administration page will open displaying the ingest profiles that have been created for the account. Click the ingest profile name for the profile you want to set as the default. Click the Uploading or Social clipping link at the top of the page to set current profile as the default. Note: Only Dynamic Delivery profiles can be set to be a social clipping default profile. Legacy and CAE profiles are not supported. Ingest profiles can be hidden by clicking the slider associated with the profile to the Hide position. This is useful to hide default profiles that may not be needed. Ingest profiles that are hidden will not appear in the Ingest Profile list in the Upload module. Ingest profiles are defined using JSON. To view the JSON syntax for a profile, edit a profile and then click the Advanced Editor tab. 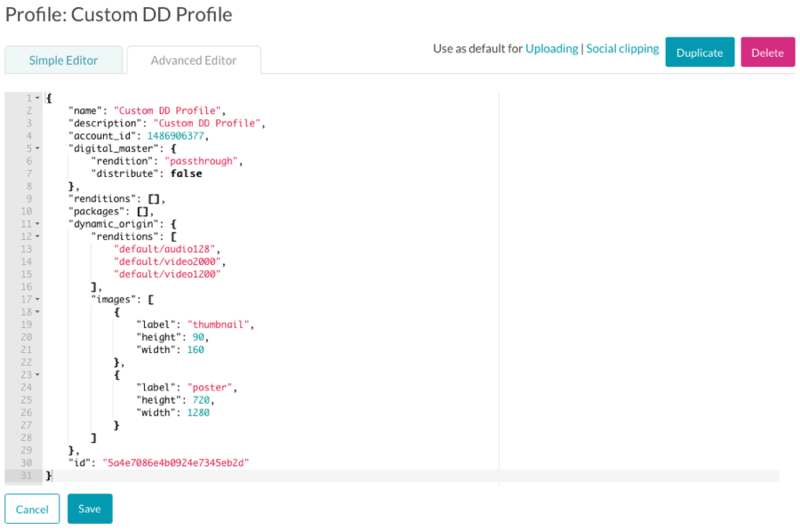 The JSON representation of the profile will display. While the JSON can be edited here, Brightcove recommends editing profiles using the Simple Editor to reduce the likelihood of mistakes. For information on the available attributes, see the Ingest Profiles API Fields Reference for Dynamic Delivery and Context Aware Encoding topic.